Harry N. Abrams, 9781617691881, 288pp. "Tessa Huff has a way with cake. In her hands, butter, sugar, flour, and eggs become something more than mere ingredients in a recipe, and cake is elevated to art form. I could happily feast for days on just her photographs of these creations, but Tessa's companionable presence and quiet insistence throughout this book that I, too, can make these beauties for myself pulls me straight into the kitchen. Too pretty to eat? Nah. Grab a fork." "Stacked tall and frosted to perfection, Tessa elevates the art of layer cakes to new heights. 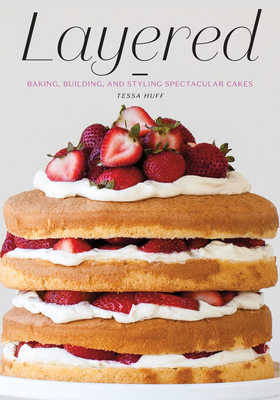 With ingenious flavor combinations, foolproof recipes, and beautifully illustrated techniques, Tessa will have you whipping up drool-worthy, gourmet cakes at home. Layered is simply a treasure for every cake loving baker." "Ms. Huff has created a beautiful book, loaded with equal measure classic technique and modern flavor sensibility. Anyone who considers themselves a baker will feel their pulse subtly accelerate simply by thumbing through these pages." "Layered is a book that will have a permanent spot in my kitchen. From the stunning imagery to the decadent recipes, Tessa has created a must-have book for all bakers and cake lovers. She's an amazing stylist and her recipes are flawless!"